Is Pink Stifling Blue In Breast Cancer Awareness? October is Breast Cancer Awareness Month as you are all now well aware. The whole of the world seems to have turned pink, in what I consider to be a vulgar worldwide commercial venture. But it is only in relatively recent times that most of us understood that men get breast cancer too! I know from the huge efforts publicising my own projects how much work must go in to ensure that men are also talked about in the same breath as breast cancer. 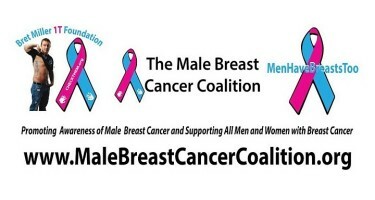 So I am truly honoured to feature the below piece from my great friend Bret Miller the founder of the Male Breast Cancer Coalition, in Male Breast Cancer Awareness Week. Seven years later I graduated from college, landed a steady job at a country club managing their pool and ice rink and had my own health insurance for the first time. I decided it had been way too long since I had a physical, so made an appointment with internist. The doctor did the routine work up and all but checked me out, until I stopped him and asked him to look at the lump. He didn’t check my breasts during the exam. He paused looked and said, “You need to go get an ultrasound.” Little did I know this meant I was walking into a women’s clinic for the first of many appointments to come. I felt embarrassed to walk in for my appointment knowing I would be the only guy patient. As I sat down to fill out the paperwork the questions asked were, “Are you pregnant?” or “When was your last menstrual cycle?” There weren’t very many questions I could answer. They did the scan and had the on-call doctor check to make sure they captured what was ordered by my doctor. This doctor did a triple take between me and the ultrasound and thought I should also have a mammogram, “Just so I didn’t have to come back in.” I think the doctor, a female, had an idea of what I was up against, but she didn’t mention anything. I met with one surgeon and decided to take the lump out, thinking it was nothing but a cyst. The day following the surgery, I received THE CALL from the doctor and he said those words, “You have breast cancer.” He hadn’t fully read the report, would do so “soonish” and call me back in two or three days. When I eventually told my mom, she jumped on that doctor like a lion. We met with him the very next day! We listened to what he had to say and decided to get a second opinion. That’s when we met with the extremely talented Dr. Lon McCroskey. He told me he had performed mastectomies on 12 men and if I wanted to talk to one of them, if I had questions, he would try and get me in touch with them. Almost all of these men had taken vacation time off from work for their surgeries, rehabbed and went back to work like nothing happened. All while having a mastectomy scar below their shirts. Dr. McCroskey made a promise to me that he would do everything in his power to make sure this cancer was gone from my body, if I made a promise to him. The promise was I would help put a face to male breast cancer. At that moment I knew I had a new mission in life. No man would ever feel alone again when he heard the words, “You have breast cancer.” I decided to start the Bret Miller 1T Foundation because I knew if I helped just one other man, my mission would be complete. Within the first six months of my diagnosis, I spoke with my very first man. It was a great feeling. I felt complete, but knew I was not done and had to keep going. Yes, we have breasts. We have mastectomies. We have chemo. We take Tamoxifen and can have side effects just like women. We should not feel alone. I am very pleased to be an official Support Partner of The Grove Hotel in Bournemouth, which is the only hotel in the UK specifically for people affected by cancer. It is good to get this information out there, so that young men who find a lump in their breast will be properly diagnosed. It’s kind of scary to me that just because we don’t think of men having breasts, they get misdiagnosed. Thank you for putting this out there. Verite Reily Collins on Cynical And Misleading Cancer Advertising! Beverley Sarstedt on Cynical And Misleading Cancer Advertising! Chris on Cynical And Misleading Cancer Advertising!